Read about what’s happening in today’s news that affects your daily commute. We’ve consolidated a collection of the latest articles about transportation and commuter related trends and challenges faced by Washington area commuters. Be sure to check back on a regular basis to keep tabs on the most up to date news. Visit our construction projects section and learn about upcoming road improvements taking place around the Washington region. Anticipate roadwork delays and avoid the snarls to stay ahead of the construction curve. Find out about upcoming events that pertain to commuting in the Washington metropolitan region and read recent Commuter Connections press releases. Put A Bridge On It: Building New Connections In D.C.
More than 3,000 Take the Car Free Day Pledge for September 22; Join Them and Win Great Prizes! Car Free Day Free Registration is Now Open! How can the region avoid fiascoes like Thursday’s Beltway meltdown? The DC Circulator Is Now Free. Who Is It Helping? Bolt joins Arlington scooters; top scooter complaints? Pay-per-mile driven instead of gas tax? Testing with tolls coming to Va.
Boeing’s futuristic flying taxi gets off the ground in Manassas, Va.
Washingtonians Gripe About September Traffic, But How Bad Is It? Are tolls worth it on Virginia’s HOT lanes? How Would The D.C. Region Handle A Metro Strike? Are dockless bikeshare systems changing Washington’s biking culture? Who Has A Right To D.C.’s Sidewalks? Six Months Of Dockless Bikes And Scooters: Fad Or Fixture? The high-speed ‘maglev’ promises many things, but at what cost? Bikesharing Is Popular In D.C. Will Scooter-Sharing Be The Next Big Transit Trend? First came UberPool. Now there’s an even cheaper option, but it requires some extra effort. Metro is mulling a major redesign of the bus system. But first, officials need to figure out why people aren’t riding. What code red days? Washington achieves best air quality in decades. Who has the longest average commute in the DC area? Numbers Show Metro May Actually Be Improving — But Will Riders Return? ALEXANDRIA – The Virginia Department of Transportation will hold a design public hearing Tuesday, March 26 on plans to improve about three miles of Richmond Highway (Route 1) from Jeff Todd Way to Sherwood Hall Lane in Fairfax County. The recommended design will widen the road from four to six lanes, provide bike paths and sidewalks on both sides of the road, and reserve the median width necessary to accommodateFairfax County's future Bus Rapid Transit plans for dedicated bus-only lanes. The public is invited to stop by between 6:30 and 8:30 p.m. in the auditorium/cafeteria (use entrance 4) at Mount Vernon High School, 8515 Old Mount Vernon Road, Alexandria, VA 22039 to learn more about the project, as well as review and provide input on the preferred design plans. VDOT staff will be available to answer questions. A presentation will begin at 7 p.m. If canceled due to inclement weather, the meeting will be held at the same time on Thursday, April 11. 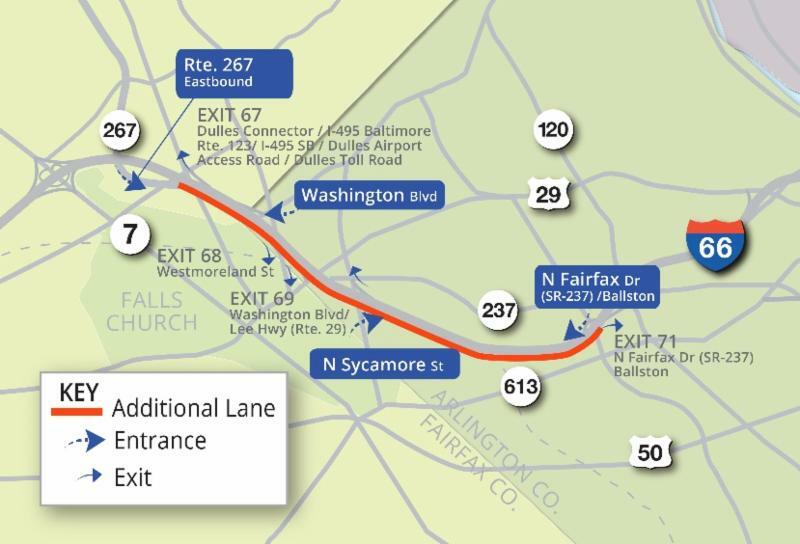 FAIRFAX – The Virginia Department of Transportation will hold a public information meeting Tuesday, March 5 on plans to construct missing segments of the shared-use path along northbound Route 29 (Lee Highway) between Vaden Drive and Nutley Street (Route 243) to improve safety and accessibility for bicyclists and pedestrians. The project will also extend the Route 29 culvert over the tributary of Accotink Creek just west of Nutley Street to accommodate the shared-use path. The project is being funded by part of the concession fee provided under the Transform 66 Outside the Beltway Project Comprehensive Agreement. Stop by between 6:30 and 8:30 p.m. at Fairhill Elementary School, 3001 Chichester Lane, Fairfax, VA 22031 to learn more about the project and review proposed plans. VDOT staff will be available to answer questions. A presentation will begin at 7 p.m. If canceled due to inclement weather, the meeting will be held at the same time on Tuesday, March 19. Provide comments at the meeting, or send them to VDOT by March 15, 2019. Email or mail comments to Ms. Hong Ha, P.E., Virginia Department of Transportation, 4975 Alliance Drive, Fairfax, VA 22030. The Northern Virginia Transportation Authority is pairing up with the Northern Virginia Transportation Alliance to host a forum on “The Economic Impacts of Transportation Investments.” Experts in transportation, real estate, heavy construction, and business will convene on February 6th from 10:00 am to 11:00 am to discuss how transportation factors into business decisions, as well as take a look at a recent Northern Virginia Transportation Authority study on the economic benefits of the Authority’s $3 billion in regional funding of transportation projects aimed at tackling congestion across NoVa. 3) NVTA’s funding of $1.9 billion in 95 multimodal regional projects has triggered another $3.8 billion in additional investments = $5.7 billion in critical transportation projects to NoVa. Additional details are in the invitation below. If you’d like to attend, please visit our registration page to RSVP by clicking here. We hope to see you soon! The District Department of Transportation (DDOT) will host its first public event for the Rock Creek East I Livability Study on Wednesday, February 6, 2019, from 6:30 pm to 8:30 pm. The purpose of this neighborhood study is to identify opportunities to enhance community quality of life through transportation safety and access improvements for all modes within the study area. At the first public event, DDOT will introduce the project, share data collection, and provide opportunities for participants to share existing concerns. DDOT is undertaking the Rock Creek East I Livability Study to evaluate the transportation network in the study area from a system perspective, and look for opportunities for a safer and more accessible multimodal network. This study will be led with a data-driven approach, using existing and future conditions to understand transportation challenges and opportunities and to recommend specific implementable actions. The study will be supported with robust public outreach throughout the process. You can find out more about the study by visiting www.rceast1.com. Starting August 6, the 95 Express Lanes morning reversal will change to 10:30 a.m.
We heard you. Our customers gave us feedback about the northbound reversal time and now the 95 Express Lanes reversal schedule will shift starting Monday, August 6 until the Tuesday after Labor Day (September 4). The Lanes will stay pointed northbound for an extra 30 minutes until 10:30 a.m. This is the only change to the summer reversal schedule. Always be in the know about any Express Lanes updates. Check lane directions, traffic patterns, and real-time toll prices on our website. FALLS CHURCH – The Virginia Department of Transportation will hold a design public hearing Thursday, June 14 on plans to build a pedestrian and bicycle bridge and shared-use path in the vicinity of Route 123 and I-495, to improve bicycle and pedestrian safety and connectivity in the Tysons area. Improvements include a new 10-foot shared-use path (shown in blue on map) from near Tysons One Place and Fashion Boulevard to Route 123 and Old Meadow Road via a new pedestrian and bicycle bridge over I-495; the path will mostly follow Old Meadow Road. Stop by between 7 and 9 p.m. at George C. Marshall High School, 7731 Leesburg Pike, Falls Church, VA 22043 to learn more about the project, review proposed plans and provide input. VDOT staff will be available to answer questions. A presentation will begin at 7:30 p.m. Provide comments at the meeting, or send them to VDOT by June 29, 2018. Email or mail comments to Mr. Abi Lerner, P.E., Virginia Department of Transportation, 4975 Alliance Drive, Fairfax, VA 22030. The Virginia Department of Transportation (VDOT) will host a Public Information Meeting about the environmental study of plans to extend the I-495 Express Lanes by approximately three miles from the I-495 and Dulles Toll Road interchange to the vicinity of the American Legion Bridge and Maryland line. Project staff will be on hand to answer one-on-one questions before and after the presentation. Construction is getting underway and the new eastbound lane is scheduled to open in Fall 2020. Meeting attendees can view project plans and talk with project team staff. Click here for a printable flyer with meeting details. Visit www.inside.transform66.org for project information.